The Cook Strait steamer Penguin was on the Nelson-Picton-Wellington run when it sank off the Wellington southwest coast on the night of February 12, 1909. 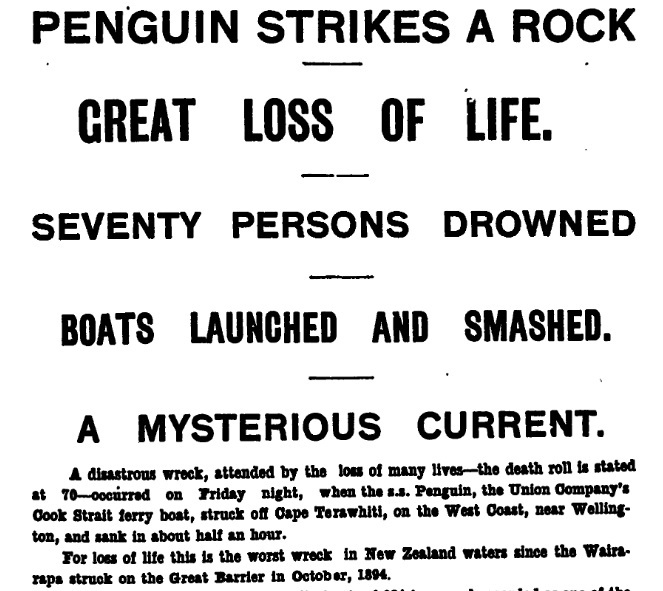 When the ship named Penguin sank into the waters of Cook Strait 110 years ago , survivors heard a "tremendous explosion". It was one of the Cook Strait steamer's boilers being flooded with cold water. Soon the ship broke nearly in half and went down nose first. The disaster, just off Wellington's rocky southwest coast, was the deadliest maritime tragedy in New Zealand waters last century, with just 30 survivors. Varying accounts put the death toll at 72 or 75 - far more than the 53 who died as a result of the Wahine sinking at the entrance to Wellington Harbour during ex-cyclone Giselle on April 10, 1968. Penguin was on the Nelson-Picton-Wellington run. It left Picton at 6.20pm on Friday, February 12, 1909 and the weather was fairly clear as it entered Cook Strait from Tory Channel shortly before 8pm. The weather deteriorated into a strong southerly with heavy seas, rain and poor visibility. The Penguin was steaming at full speed within 6.4km of what a later inquiry called the "coastal danger" of southwestern Wellington province. The master, Captain Francis Naylor, was unable to see the shore. A tide that was stronger than Naylor had realised is thought to have pushed the Penguin into unrecognised danger. Naylor was trying to head out to sea when the ship struck an object which tore a fatal hole in its hull at about 10pm. Some thought the ship hit a drifting wreck, but the inquiry agreed with Naylor that it smashed into Thoms Rock, which is about 1.5km off the outfall of Karori Stream and about 9km southeast of Cape Terawhiti. Even today it is an isolated spot on a dangerous, craggy coastline studded by rocky reefs and cliffs. Preparations were made to get the women and children into the lifeboats, but the boats proved lethal. Some of the five boats were smashed or swamped as they were being launched in the rough seas, others capsized; they floated ashore, badly damaged and, for the most part, empty. All 10 children who were on the ship died in the sea. Only one woman made it to shore alive. She lost her husband and four children, including a baby who was strapped into the lifeboat and was found dead when untied. Two rafts were launched, one with 10 men, the other with 12 people on board, mainly crew members. Those on the rafts - which overturned several times - got ashore, but only six people who left in lifeboats survived the night. "For eight miles the beach is strewn with wreckage," the Herald reported. "Most of the bodies of [those] drowned so far recovered came ashore in a little bay near a [sheep station] homestead occupied by a Mr McManemin, who rendered splendid aid to the survivors." "The survivors had a hard time of it. Thrown ashore, with what little clothing they had on soaked through, they huddled together in some scrub till daylight, when clothes and food were provided by Mr McManemin. Charles Jackson, a sailor from the Penguin, described the disaster to a Herald correspondent. "When the vessel struck, there was a sound like the rending of a gigantic piece of calico. I knew at once that the steamer had struck, but we kept going for a while." Seawater was found flooding into front parts of the ship and preparations were made to get off. "In a short space of time no. 1 and no. 2 lifeboats were ready for launching with the women and children. The sea was running mountains high, and the task was a difficult one. "Great waves thundered against the sides of the ship. One boat after it was launched was smashed to pieces. No. 1 lifeboat, however, got clear of the ship, but owing to the cruel buffeting it was subjected to by the waves she started leaking." Jackson was helping the second officer to launch another boat. "We had got the boat out of the davits when a tremendous sea struck under the bottom, and she capsized." After all the female passengers had left and the Penguin was fast "settling down", men "huddled about on deck", said Jackson, who got onto one of the rafts. "We had our full complement aboard, and were just drifting away from the ship when the boiler burst with a tremendous explosion, and the ship slipped out of sight. Fortunately we were a sufficient distance from the vessel to prevent us from being sucked under." "We overturned on three occasions. Once I got away from the raft about 20 yards and again my ability as a swimmer was responsible for saving my life." "It was really pitiful when the raft overturned to see men struggling in the water, and it was magnificent to see them helping each other to a place of safety." In an inquiry by a Nautical Court, Captain Naylor was found guilty of "wrongful default" by not putting out to sea sooner. His master's certificate was suspended for a year. His appeal in the Supreme Court failed, according to the Evening Post. The appeal judge, Justice Cooper, on leading mariners' advice, faulted Naylor for continuing at full speed when the ship's water-speed instrument had failed, the weather was so "thick" he couldn't see the land which he must have known he was near, and he passed inshore of a steamer coming out of Wellington.